on the woodside. : *too hot to handle. Never mind, of course, that it's 110 degrees in the shade here, in that ever-pleasant Southern time of year known as Oppressive Humidity and Big Spider Season. Jealous? 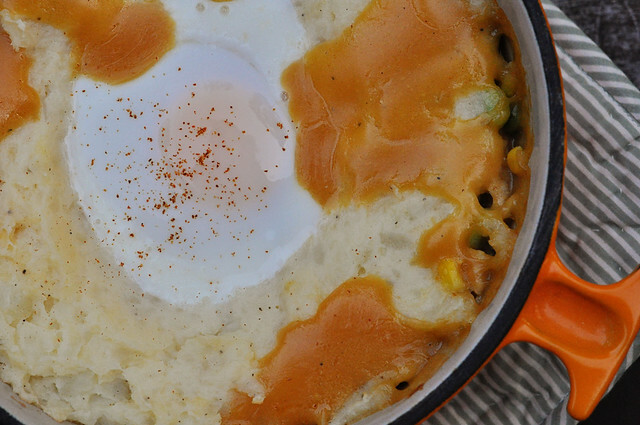 Clearly, shepherd's pie is an absurd notion given that it's exhausting to stand up, much less stand over a hot stove/oven, but you try coming between me and my mashed potatoes. Especially when I'm already hot and cranky. I did some good long thinking about shepherd's pie and decided that for me, it probably wasn't decadent enough. That means it would require the kind of richness that only cheese and an egg can provide. One has to counterbalance all those vegetables, you see. The paprika here is just for show. Any combination of vegetables, fresh or frozen, that is your favorite will work here. I love adding Worcestershire sauce and mustard and sriracha to my gravies, but that's absolutely a matter of personal preference—taste and adjust the seasonings you like best. (Experiment! It's fun! What could go wrong?! You can still order pizza!) The amount of time it takes the egg to cook will vary, but it's probably longer than you think. Luckily the potatoes insulate the stew and keep it from overcooking, and the more they dry out in the oven, the starchier and crispier they get. But don't you dare let that yolk overcook. That's blasphemy. 1. Boil potatoes until tender; drain, and mash with sour cream, salt, and pepper. Stir in cheese, and set aside. 2. Heat olive oil in a skillet over medium heat; add garlic, and cook 1 minute. Add turkey, stirring until browned and cooked through. Move turkey and garlic to edges of pan, making a well in the center, and add butter. When butter is melted, sprinkle with flour, whisking 1 to 2 minutes. Slowly add broth, whisking constantly, until mixture is desired consistency. Add lima beans and next 5 ingredients, stirring until heated through. Season with salt and pepper to taste. 3. 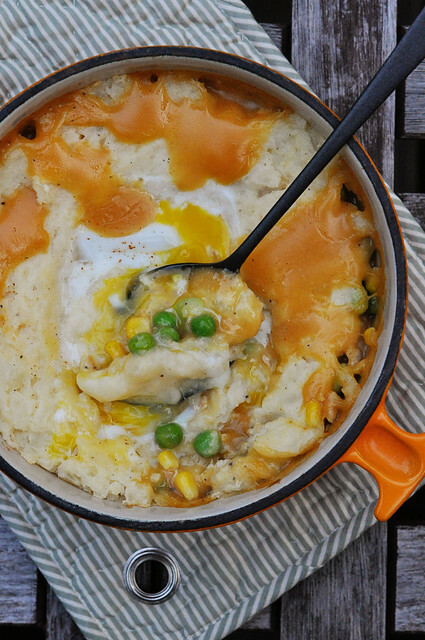 Pour turkey-and-vegetable mixture into a large ramekin or other ovenproof dish; top with reserved mashed potatoes. 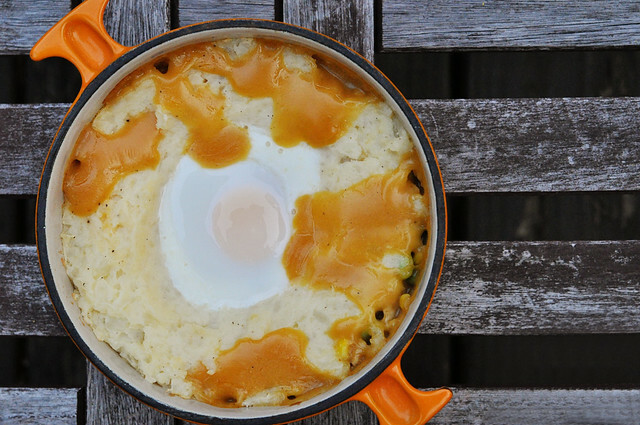 Using a large spoon, make an indention in the center of potatoes, and crack egg into it. 4. 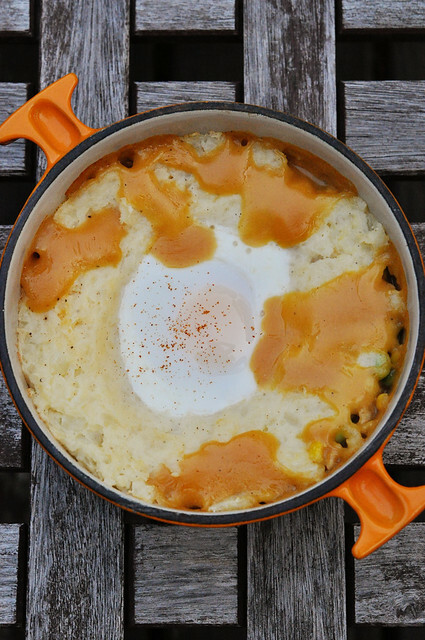 Bake shepherd's pie at 425 degrees until egg white is just set and yolk is still runny. Garnish, if desired. Makes 1 serving.